This is a very compact, portable and efficient little heater that will definitely warm up your room in no time. The Air Choice product comes with 3 modes, programmable thermostat, and excellent safety features to ensure maximum protection in your home. To start off, this portable heater comes with a metal grate and a wood shell and what is more, it will match your room’s décor without a doubt. Also, you can place it on any surface like laminated or wooden floors since the unit does not heat up when turned on. Nevertheless, the unit is only tested for a 20-square meter room and for these dimensions it will surely provide enough warmth. 3 modes come with this heater, and each one uses a different voltage. The “high” mode will give quick and substantial heat within 5 seconds at 1500w, while the low mode uses only 750w of your energy. 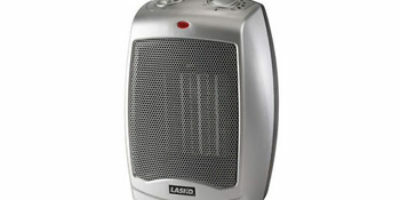 The range of temperature settings you can program on the portable heater range from 59 °F to 86° F. As for the Eco mode, it is designed to maintain the desired temperature throughout the day. Moreover, the in-built thermostat will help keep your preferred temperature and regulate the warm air coming from the unit. 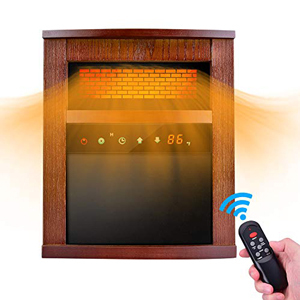 This way, when the space heater reaches the set heat level, it will automatically turn off the heating, letting the fan work until the heat is dispensed. But you may notice that the work of the device moving the air around lasts for too long and can actually continue all day. And hence, your electricity bills will get more significant than usual. 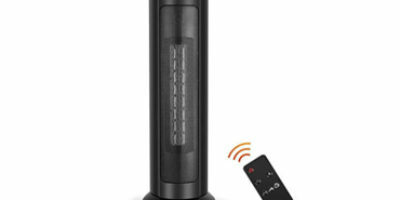 Another feature is the remote control with which you have access to all the functions of the product. You can change the temperature, turn on or off the heater, select the desired mode and most importantly, take advantage of the programmable timer. This feature is a great helper because you can set the timer of up to 12 hours and this means that every time you get back home from work, you will enter a comfortably warmed room. But there is one thing that we do not like that much, and this is the lack of any screen on the clicker. You will not be able to see what temperature you have previously set without coming close to the heater itself. The Air Choice electrical heater has 3 main features to ensure maximum protection while it is on. First is the overheat protection which will guarantee that the unit will not get hotter than 105°F. If this happens, though, the unit is programmed to turn off right away. Next is the tip-over protective feature. You will really appreciate the fact that if accidentally kicked down, the heater will stop working immediately and therefore prevent any risky or life-threatening situations. Finally, there is a cord clamp at the backside of the portable heater to keep the electrical cable in place. This way, there will not be a power line to trip over. There is a 1-year warranty. However, no phone number is indicated in the manual for customer support.